Its 9:30am on Christmas Morning and maybe after a late night of wrapping presence and wrestling with those deceptive words ‘some assembly required’ you’ve been up early you’ve been awake for hours. How can you sleep with the kid’s excitement: the joy of children wanting to open gifts and there has been lots of running round and exuberance. Then to get here you’ve had to gather that energy and joy up, brush hair and teeth bundle them into the car. But you’ve come to acknowledge Jesus birth the fact that God is here with us. It’s 9:30am on Christmas morning. You’d worked hard and long to make sure everything was done for the holiday and for the end of the year. So you could get away for the sun and the sand and the surf, to catch up with the family and friends. You just want to stop and catch up with yourself. You could really have done with a sleep in till you had to go round to the family for Christmas lunch. But you’ve come to worship Christ the new born king… to celebrate the fact that God is here with us. Its 9:30am on Christmas morning and so many other things could be going on. Christmas is the time when you remember they have gone and it is the loneliest time. Your thoughts are on juggling families broken and blended. It’s just another work day as the person who served me lunch yesterday said. It really does not help with the finances. There are some big things looming in the New Year. 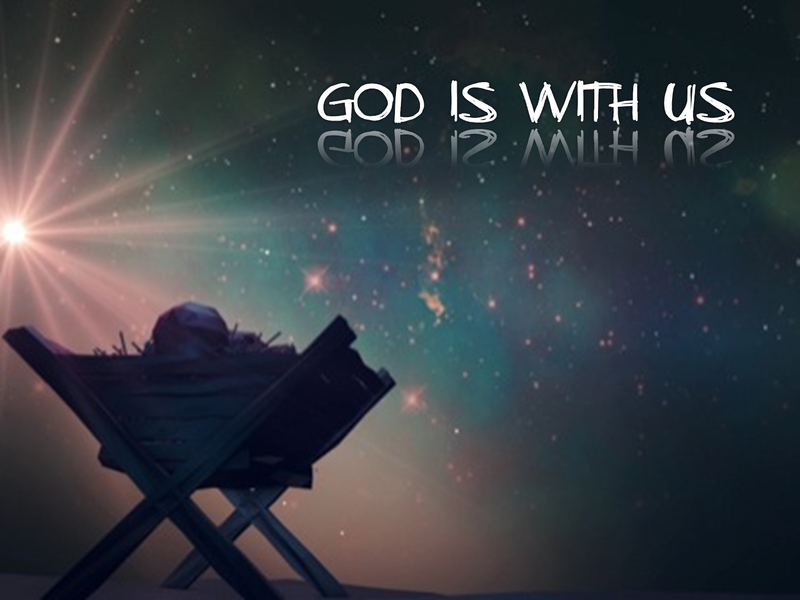 But even in the midst of that Christmas reminds us of the amazing truth that God is here with us. Luke’s gospel had the ring of everyday life carrying on and into those steps the saviour that God’s people had been looking for, waiting for so long. Into that is born a child who we are told is Christ the Lord. The light has come in to the world. The reading we had this morning starts by talking of who’s in power, Augustus Cesar, and who the local administrator is. That in order to gather taxes there is a census. This means that everyone is on the move going back to the town where they are from, to be registered. It politics as usual it’s the powers of this world going about their business. Last night we looked at Matthews’s nativity narrative, we saw how similar it was then as it is now… Matthew focuses on Herod the local dictator so desperate to hold on to power that he sends death squads to kill his own citizens. All baby boys under two. That Mary and Joseph and Jesus become refugees fleeing from that tyranny and violence. And amidst the swirl and whirl of human history we are told that God steps in to our world. The Kingdom of God is established in the realms of humanity. Not in a big bold flashy way, but in a way that there is no room for to be born because of the upheaval and disruption. The son of God s born in a stable and laid in a animal’s feeding trough. God is here with us and his coming identifies with the poor and the lowly. The first to hear the good news of Jesus birth are shepherds…Shepherds on the night shift. Doing what they always do… washing their socks… I mean watching their flocks. They are told the good news of the saviour’s birth and see what must be the greatest production number of all time as the heavenly armies gather to sing God’s praise. Maybe for us shepherds in fields is an exotic and romantic picture… In our world maybe it would best to see it being like… when we came home late one night on the train and we saw lights on in tall offices buildings along the tracks. They were on because the cleaners, that often unseen group of people, were working, minimum wage jobs, trying to make ends meet. Maybe in our urban twenty first century world they would have been the ones to hear the news, be visited by angels. Luke tells us Jesus coming was indeed good news for the poor. The shepherds go and see that what they had been told was true and then had to head back to their work, now filled with joy and giving praise to God. Christmas says God is here with us, came in the person of Jesus Christ, born into everyday life. But this baby Jesus would change everything. Because of his life, teaching, death and yes his resurrection. God’s kingdom, God’s love, forgiveness and peace would break into this world. We can be forgiven reconciled to God and to one another. Broken can be made new and whole again. God is here with us. This child’s birth means God can step into the everyday live that we have and make them something new and sacred by his presence. God is here with us and if we allow this Christ to be born in our lives that love, that forgiveness, that wholeness, God’s justice and righteousness can come into our lives, our brokenness can be made whole, our lives given purpose and meaning, we can be enabled and equipped to love extravagantly and sacrificially. God is here with us and if we allow his Son Jesus to be born into our lives today, god’s presence and love can come into the everyday world around us through our kindness, our forgiveness our sacrificial love.